Sarah Fitzgerald, an Assessor from Warwickshire Local Authority recently visited Camp Hill Primary School to review the school’s Online Safety provision. She met with the online safety lead teacher, Helen Cartwright, as well as school staff, parents and carers, Governors and pupils and was pleased to find that the school provides a high level of protection for users of the new technologies. Warwickshire LA provides the internet connection and a range of other services to schools across the county and is in the forefront of national developments in Online Safety. To enhance these services, they have supported the use of the South West Grid for Learning online tool to help schools address online safety issues, not least the recent changes to Ofsted inspections, which include a stronger focus on safeguarding. The online tool allows schools to evaluate their Online Safety policy and practice and then suggests how the school might do more to protect young people and staff. To apply for the 360°safe Online Safety Mark, schools have to reach a series of benchmark levels when they complete the online self review. The evidence is then verified by a visit from experienced Assessors. The prime benefit of using the review and applying for the 360 Mark is that it does not focus on the individual aspects of Online Safety such as technological solutions, but instead it integrates Online Safety into school policy and the curriculum, challenging teachers and managers in the school to think about their provision and its continual evolution. Schools are expected to show that they have provided a high standard of Online Safety education and awareness for all staff, pupils and also for parents and carers, to ensure that these users of the new technologies can be safe online – whether they are in school, in their homes or out and about using mobile phones or other handheld devices. Following their visit, Sarah reported that the school are extremely proactive in making sure they are up to date with the latest technology and trends and as such make full use of parent and pupil surveys and quizzes. This enables the school to effectively deliver training and Online Safety sessions with timely, relevant content. 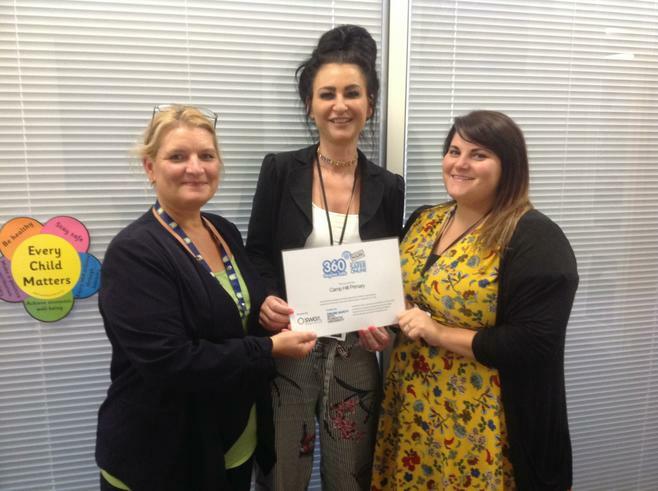 Sarah Fitzgerald, Assessor for the 360°safe Online Safety Mark congratulated the school on its success and commented that it was re-assuring to know that the school had put a lot of thought and effort into improving the online safety of the staff and young people, by addressing these important safeguarding issues.